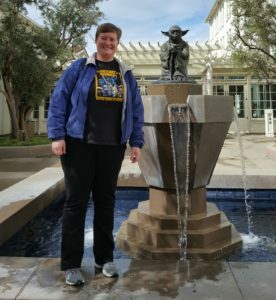 Amy Wishman Nalan writes and podcasts about her love of Star Wars on a variety of platforms. She was kind enough to answer a few questions via email for 365 Days of Star Wars Women. Like many kids of the 80s, I was introduced to Star Wars via VHS in my family’s living room. My mom put in A New Hope for my brother and I, saying something like “You’ll like this.” Needless to say, we did! My most distinct memory from those early viewings was the Tusken Raider surprising Luke as he is looking through his macrobinoculars. This terrified me as a kid! I love many of the characters–it’s hard to choose just one. I love Chewbacca and Zeb for their loyalty and honor, C-3PO because he is the character I’m most like in the saga. I identify with Ben Solo/Kylo Ren as someone who has struggled with depression and anxiety throughout my life. I admire Shmi and Padme for their understated and underrated kindness and love. A new favorite is Qi’ra–always the smartest person in the room, always thinking and planning and surviving. I would want to hang out with the Ghost Crew on Lothal! 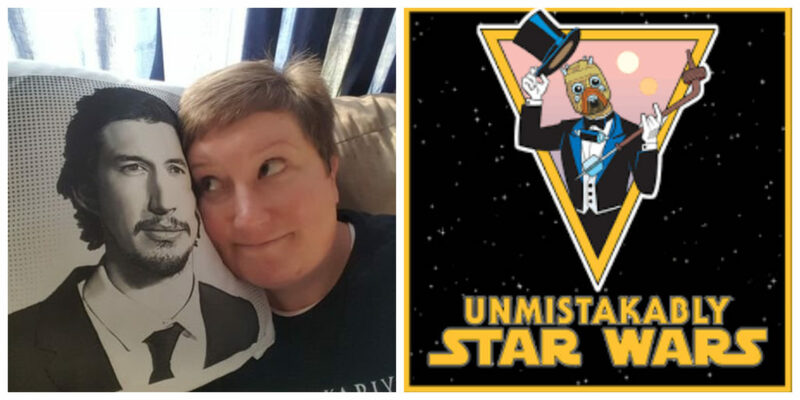 You’re a contributor with the Unmistakably Star Wars podcast and website. Can you share how you became involved with them and what your favorite podcasts or articles have been with them? I had started interacting with the USW team initially as a fan and listener of their podcast. At one point, they solicited feedback from listeners and I sent some in. Jeremy Scott messaged me back, saying he thought I should write an article about it. This evolved into an opportunity to write more. I guested on an episode about Droids and had so much fun, I was eager to join in again. My favorite podcast with them is the first episode I guested on–when I got to discuss my love of droids and C-3PO in particular. I know you have been a guest on different podcasts as well – any favorites? I’m also curious what your favorite podcasts to listen to are. 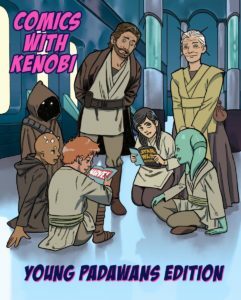 I am regularly on Comics with Kenobi Young Padawans Edition where my kids and I discuss the Star Wars Adventures comics with Matt Moore (and sometimes his son Jerry) of Comics with Kenobi. I’ve also guested on Sapphic Skywalkers, Knights of Wren, Moonjockeys, Hyperspace Podblast, Coffee with Kenobi, and What the Force. A special project I’ve been affiliated with is Podmé: a Padmé-centered podcast. I’m one of five co-hosts and we periodically release shows focused on Padmé and her role in a Galaxy Far, Far Away. As far as listening, my favorite Star Wars podcasts to listen to are Skytalkers, Geeky Bubble, Scavenger’s Hoard, Who Talks First, Blast Points, and Children of the Force. My favorite non-Star Wars podcasts are Metamashina and The Baby-Sitters Club Club. You watch Star Wars TV shows and films with friends on Rabbit. For those who are unfamiliar with Rabbit can you explain what it is and why you enjoy using it? Rabbit is an app/website that allows you to stream content and screenshare it with others. You can interact while watching via chat or text box. It’s essentially an online movie night with friends. I’ve been doing a Clone Wars rewatch since the announcement of the series’ return and it’s just a blast. As someone who doesn’t have anyone outside family to watch Star Wars with, and someone who has friends online that I rarely (if ever) see, Rabbit is the next best thing. I think it’s safe to say you are a fan of books! What are some of your favorite Star Wars books and comics? Do you have other non-Star Wars fantasy/sci-fi book or comic recommendations for Star Wars fans? I love books and am an avid reader! I love the Star Wars Adventures comics–the stories have been so fun and joyful, full of little touches and Easter eggs, and the art is stunning. Some of my favorite Star Wars books have been the Solo novelization by Mur Lafferty, the Revenge of the Sith novelization by Matthew Stover, the Aftermath Trilogy by Chuck Wendig, and the X-wing books from Legends–particularly Iron Fist and Starfighters of Adumar by Aaron Allston. As far as non-Star Wars books that “feel” Star Wars, I’d recommend Six Wakes (also by Mur Lafferty). It’s And Then There Were None in space with clones. Other space opera series I am enjoying are the Vorkosigan Saga by Lois McMaster Bujold and the Wayfarer’s Series by Becky Chambers. For people who have never read fanfiction can you explain what fanfiction is, where you can find it, and why you enjoy reading it? Any specific recommendations? Fanfiction, simply put, is fiction created by fans featuring characters from movies/TV/Books/Etc. I read fanfiction on AO3 but you can also find it on Fanfiction.net, wattpad, Tumblr and more. I love fanfiction for many reasons. It’s a labor of love–the creators of this art (and yes, it IS art) put hours and hours into creating stories for a community of fans and they do this for no money. The works vary in quality (like published books) but some of the best things I have ever read have been fanfiction. There is something very powerful about taking existing characters and shaping the narrative according to your will. It can allow for different relationships, outcomes, greater representation and exploration of different scenarios and themes. I think often fanfiction is perceived as “less than” or “silly” because it is largely written by women for women; but consider the response to The Last Jedi and the fact that instead of raging online people could have poured their energy into a story to their liking. It’s much healthier to create instead of tear down. I read a lot of Reylo fanfiction (Rey/Ben Solo or Kylo Ren). A favorite of mine is a duology called Sword of the Jedi. Did your Star Wars fandom change after you became a mother? Did any of the storylines affect you differently? What are your favorite Star Wars moms and is there a Star Wars character’s mom you would most like to see introduced in films/TV shows/books? For me, Star Wars is a family affair. 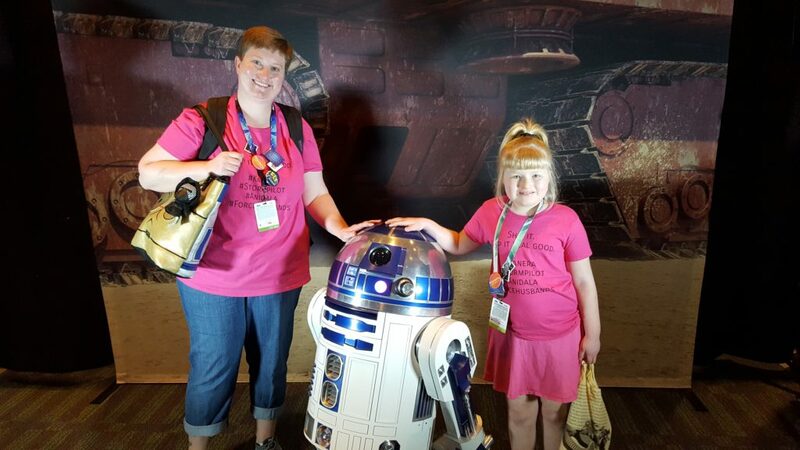 Star Wars is something we do together, and being able to experience Star Wars with my kids is the foundation of my fandom. After becoming a mom, my view of the prequels changed drastically after my then seven-year-old pointed out that I was being very hypocritical in my views of Jar Jar. The Phantom Menace took on new meaning, particularly Shmi Skywalker and her relationship with Anakin. Shmi remains my favorite mom in Star Wars. Her willingness to let Anakin go for what she hopes is a better life. Her instructions to him to “Don’t look back” as he walks out of her life, and she is left standing alone resonate strongly with me and I can’t watch that scene with dry eyes. I wish we could learn more about Shmi, and about all the moms who have been sacrificed on the alter of character development in Star Wars. I’d love to know about Shmi’s early life, Padme’s mom. And what about Mortis? Where is the Mother there? The kids were seven and five, respectively. I started with the Original Trilogy. So we watched A New Hope followed by Empire Strikes Back and Return of the Jedi. At that point, my oldest, Emily, was seven and she was ALL IN. She was bitten by the Star Wars bug and neither of us has been inoculated since. My youngest isn’t as passionate about Star Wars, but enjoys Freemakers and Rebels particularly. 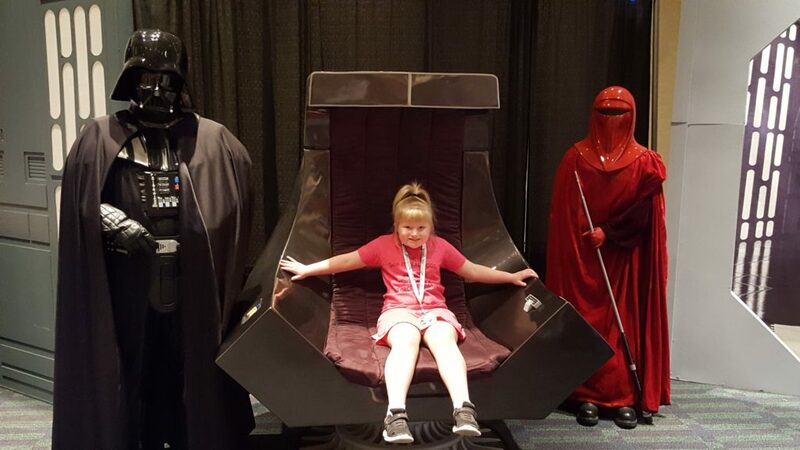 At that point, we weren’t that far away from the release of The Force Awakens and seeing that in theaters with Emily was one of the highlights of my parenting life. In a word–Amazing. I was fortunate to win passes from Stephen Stanton. It was my first Celebration and my first convention. Being around so many other fans, being able to connect with people I’d only chatted with online–it was phenomenal. I had considerable anxiety before going. I get anxious in crowds and social situations. But Celebration was incredible. The best thing was the people–and I NEVER say that! My advice for people bringing kids is to have snacks and drinks with you. Everyone is happy if they are hydrated and sated. Bring activities like card games, books, colors, etc to keep occupied while you are waiting in line. And find kid-friendly booths on the show floor–like Lego. At Orlando, there was a room that played Rebels episodes during the day, and that was a great place to relax and decompress. Being clear about merchandise and spending is important too. Orlando had a Goodwill booth that had affordable Star Wars merchandise, so Emily could get some things and not bankrupt me. You have talked on Twitter about how you want to see more female Star Wars characters who aren’t a size 0-2. Do you feel like there are any good examples of female Star Wars characters in books, comics, films, etc. that look more like average women in America look? Some size diversity in Star Wars would be lovely, yes. Like everyone else, I’d love the opportunity to see someone like me onscreen. There really isn’t a good example in the films–some background characters. In a Star Wars Annual there was a character, Pash Davane, who was portrayed as having a larger upper body, but I wouldn’t characterize her as heavy, per se. This is an area where I’d love to see more representation. Definitely the novelization. As a reader, I love the internal thought processes we get in the novels–it proves essential to my understanding of the characters. If I’m being really self-indulgent, I’d say anywhere where I could be in proximity to Ben Solo/Kylo Ren. I’d settle for being the person behind the scenes who floofs everyone’s (read: Adam Driver’s) hair before every take. A YA book series featuring the Handmaidens and different adventures they have with Padmé! Another story I want told is Young Ben Solo: his early life, his time with Luke, how Snoke’s manipulations and abuse led to his fall. Where is your favorite place to talk Star Wars with other fans online right now? I spend most of my social media time on Twitter. While acknowledging that it is frequently a trash fire, it’s where my friends are, so I keep going back. Do you have any recommendations for new fans trying to find other fans to chat with about Star Wars – especially for people who feel like Twitter to too big and has too much garbage to wade through? Some podcasts and groups have private Facebooks groups, that could be a way to connect with others. I’m not on Facebook, but there are also Discords and Group Chats that could be a way to find people to connect with others that are less overwhelming than Twitter. I’d also just say if there is someone you appreciate on social media, kindly interacting with them is a way to make friends. Some people you’ll click with, others you won’t, but friendships I’ve formed on Twitter through Star Wars have become some of the dearest relationships in my life. Do you have any projects coming up you can share? In honor of Life Day and the anniversary of the airing of the Star Wars Holiday Special I will be rabbiting the Holiday Special on Saturday, November 17, 2018 at 8:00 p.m. CT. Come join to celebrate a day of peace….a day of harmony. You can find Amy on Twitter here.